Why did you choose to participate in an internship? I wanted to use some of my learned aerospace knowledge and experience some ?real world? applications of what I?d seen in class. I also wanted to be able to spend a summer in a new place and meet new people. What were some exciting projects you had the opportunity to work on at your internship? 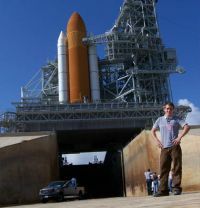 I worked for the Undergraduate Student Research Program (USRP) studying Shuttle-Derived Launch Vehicles. At the end of the session, I completed a first-order design of a manned mission to the L1 Lagrange point between the Earth and the Moon. In concordance with the Shuttle-Derived approach to future NASA vehicles, the design called for a four segment Solid Rocket Booster and a Space Shuttle Main Engine for boosting to Earth orbit. While working at KSC, I was exposed to many elements of Space Shuttle programs and processes. Among my many tours, I visited launch facilities, booster assembly and refurbishment facilities, the Vehicle Assembly Building, and the Orbiter Processing Facilities. I saw just about all of KSC's Shuttle processes, including Orbiter maintenance and inspection, booster stacking, vehicle assembly, Shuttle rollout to the launch pad, the launch of STS-114, booster return to KSC, and preparation for future launches. It was truly a blessing to have had such an incredible educational experience. Of course, the launch was the most exciting. Was there anything unique about your experience that you can share? As another exciting finish to the program, I was selected by NASA and USRP to represent NASA?s student programs and show my summer work at the International Astronautical Congress in Fukuoka, Japan. The conference took place during one week in October, where I was able to experience a truly international gathering. I met with engineers and scientists from Canada, England, France, the Netherlands, Germany, Spain, Italy, Portugal, Russia, Singapore, and of course, Japan. There were many more countries represented, so my list could go on and on. I attended presentations about space exploration and technological breakthroughs. It was interesting to see the Aerospace world from so many different perspectives.